This final week of focus on the vegetarian, vegan and dairy-free aisle, highlights a few different brands, Tofuti Cream Cheese, Alamir Falafel and Living Goodness Krauts. When these are combined with my sundried tomato pesto recipe, they come together to make one delicious wrap. To make the pesto combine sundried tomatoes, oil, garlic, nutritional yeast and roasted almonds in a food processor and pulse until the mixture is combined but still slightly chunky. If it looks a little dry add some extra oil. Taste and season with salt. Preheat your oven to 200c and then bake the falafel bites for ten minutes. Fill the wraps with a spread of the cream cheese, sauerkraut (or kimchi), greens, falafel and dollops of the pesto. Roll up and enjoy! Head to Fresh Choice Nelson to stock up with a selection of vegetarian, vegan and dairy-free foods; the range is extensive. For your convenience, below I’ve included the links to my back catalogue of articles focussing the vegetarian, vegan and dairy-free aisle at Fresh Choice Nelson. These posts all include my tips and ideas on how to enjoy these delicious products, so read on for inspiration! This is my second to last edition of what you can find in the veggie, vegan, dairy-free chilled section at Fresh Choice Nelson. Today I have the joy of writing about Zenzo and Tonzu. These brands are produced by Chalmers Organics who specialise in the manufacture of ‘food products where the integrity of their nutritional value can be maintained throughout the manufacturing process, and the manufacturing process has minimal or no negative impact on our environment’, which sounds pretty good to me. Organic Tofu – Made in the Japanese way. I love to marinade it in soy and a little chilli and then bake until golden and add to sushi. It’s also great cubed in a veggie pie. Organic Tempeh – Mince up with onions, garlic, butter beans and walnuts and roll in puff pastry to make veggie sausage rolls. Or, plan a play on Gado-Gado by thinly slicing, marinading in BBQ sauce and baking until crispy. Serve it with fresh veggies and a satay dipping sauce. Mango coconut yoghurt – Mix with oats, milk and frozen blackcurrants and soak overnight to make a creamy bircher muesli. Make a delicious dairy-free lassi by blending with extra frozen mango and coconut water. Sour Cream – Dollop on top of Mexican or spread on cheese scones or savoury muffins. Aioli/Mayo – Add a tablespoon to cooked peas with salt and mash for a great pea mash which is yummy on toast. Serve with oven roasted kumara chips or spread in wraps and sandwiches. Chalmers Organics also have other products like tofu luncheon and dairy free cheddar. You’ll find lots of recipes on their website which all look mouthwatering. 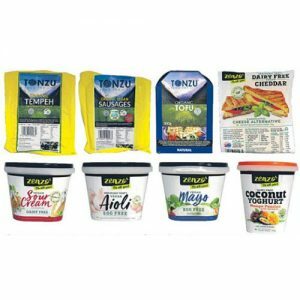 Head to Fresh Choice Nelson to fill up your fridge with exciting new inspiration from Zenzo and Tonzu. If you have walked past the chilled section at Fresh Choice Nelson recently, you may have noticed the explosion of amazing vegetarian, vegan and dairy-free options. 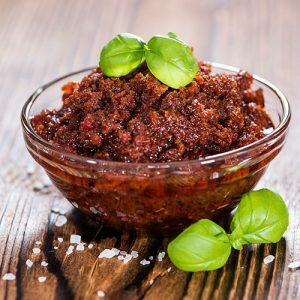 From sausages to feta, there is an alternative product for almost everything. For the next few months, I will be focusing on some of my favourite products and share tips and recipe ideas for how to use them. This week the spotlight is on a dairy-free cheese. Savour Cheese is an organic, cultured, aged nut cheese. “What’s that?” You may ask! Well, the amazing folk at Savour Cheese take nuts and activate them by soaking them, then grind them until they are smooth. The next step is to add a probiotic culture and tasty seasoning, then ferment them until the perfect acidity is reached. Sometimes, dairy-free alternatives miss the mark, but this range completely blew my mind. The complexity of flavour and texture is amazing, and I have been raving about Savour dairy-free cheese to anybody who will listen! There is a range of fantastic flavours. One of my favourites is the Ashed Smokey Cheddar. Try this thinly sliced on crackers with relish or roast pear slices, and mix chunks of the cheese with roasted pear slices, rocket, toasted walnuts and balsamic dressing. Another favourite is Casheta, a cashew version of feta, marinated in olive oil and rosemary. This goes well in a Greek salad with olives, cucumber, and tomato, or on antipasto platters. Try Savour dairy free cheese in sandwiches or on top of your favourite pasta and sauce. 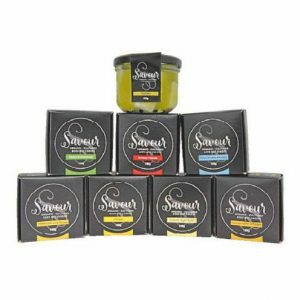 Savour also make a cultured vegan butter, which tastes divine and is great on toast, roasted veggies and mashed kumara. Fresh Choice Nelson has a wide range of dairy free cheese in store. And even if you are not dairy free, they are well worth a try, just for something new!